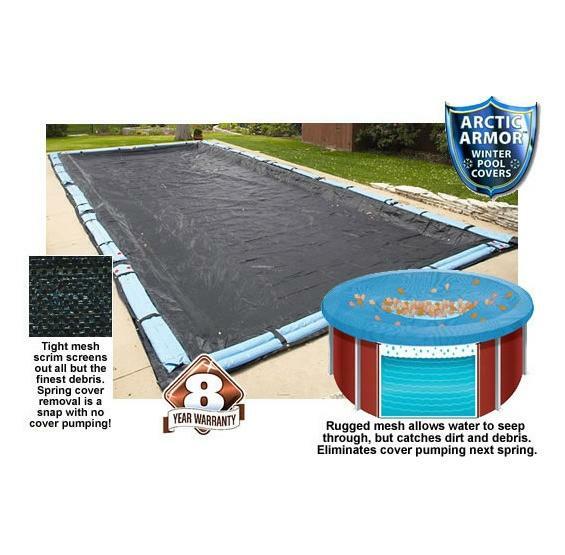 Arctic Armor Rugged Mesh In Ground Winter Pool Cover. 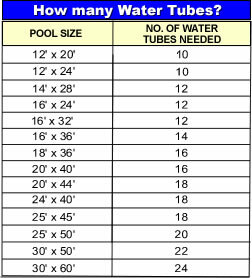 A giant 5-foot overlap provides a better fit, especially on in-ground pools. Our exclusive Rugged Mesh winter pool cover makes spring clean up a snap. 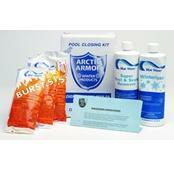 PcPools is an authorized dealer of Arctic Armor Rugged Mesh Winter Pool Covers. 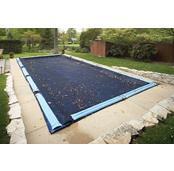 Buy a high quality in ground rugged mesh winter pool cover from PcPools today. FREE SHIPPING! 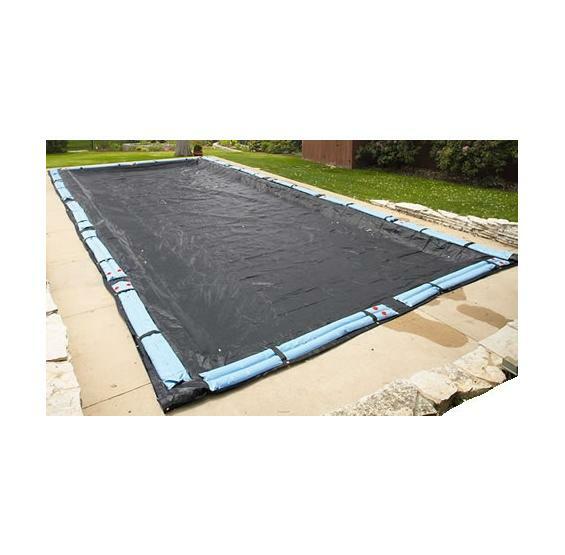 THE ENVIRONMENTALLY FRIENDLY RUGGED MESH WINTER POOL COVER THAT MAKES POOL OPENINGS A SNAP! 8-Year Manufacturer Warranty (1 Years Full Rated). Upgrade your winter pool cover to a Arctic Armor Rugged Mesh winter pool cover. 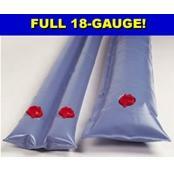 PcPools is an authorized dealer of Arctic Armor Winter pool covers. COMPARE AND SAVE! 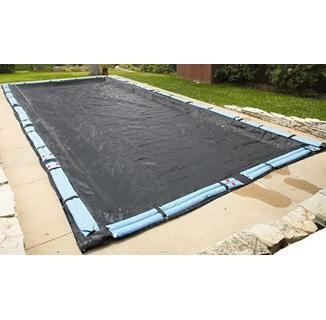 RUGGED MESH IN GROUND WINTER POOL COVER - THE ENVIRONMENTALLY FRIENDLY WINTER POOL COVER THAT MAKES POOL OPENINGS A SNAP! Our exclusive Rugged Mesh winter pool covers makes spring clean up a snap. The secret to Arctic Armor Rugged Mesh winter pool cover is the patented lace coating that holds the engineered mesh together insuring that no gaps or holes develop, like in traditional mesh winter pool covers. Because the integrity of the mesh fabric holds together, only rain water and very fine silt can pass through. The result is a cleaner inground pool next spring. 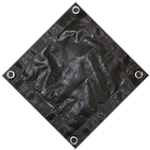 For best results when opening in the Spring, rugged mesh winter pool covers are best used in conjunction with our in ground pool Leaf Nets. Our Rugged Mesh winter pool covers allow rain and melting snow to slowly fill your in ground pool, saving pool water and pool chemicals in the spring. The silver lace coating reflects sunlight and insures a more algae-free pool in the spring. Our Rugged Mesh winter pool cover is made from tough U.V.-protected woven polyethylene that is strong enough to handle ice, snow, and sleet. Tough double-stitched hems are triple reinforced for strength and the black underside inhibits algae growth. Upgraded to an Arctic Armor Winter Rugged Mesh winter pool cover today. All our Rugged Mesh in ground winter pool covers have a 5’ overlap and water bag loops every 4 feet for secure anchoring. Corner grommets allow for extra tie down in windy areas. Water bags sold separately. Backed by an 8-Year Warranty (1 Years Full Rated).